In 1983 Stephen Colley, Dave Jurasek, John Palmer and 3 others from Intel’s Systems Group left Intel, frustrated by Intel’s seeming reluctance to enter the then emerging parallel computing market. They founded a company in Beaverton, Oregon known as nCube with the goal of producing MIMD (Multiple Instruction Multiple Data) parallel computers. In 1985 they released their first computer, known as the nCube/10. 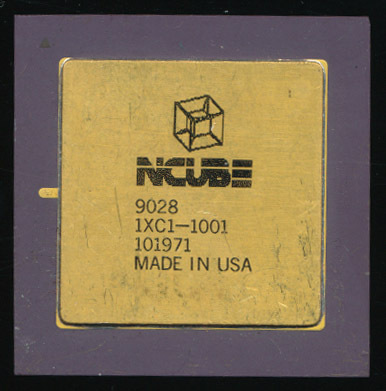 The nCube/10 was built using a custom 32-bit CMOS processor containing 160,000 transistors and running initially at 8MHz (later increased to 10). IEEE754 64-bit floating point support (including hardware sqrt) was included on chip. Each processor was on a module with its own 128KB of ECC DRAM memory (implemented as 6 64k x 4 bit DRAMs.) A full system, with 1024 processor nodes, had 128MB of usable memory (160MB of DRAM counting those used for ECC). From the outset the nCube systems were designed for reliability, with MTBFs of full systems running in the 6 month range, extremely good at the time. The nCube/10 system was organized in a Hypercube geometry, with the 10 signifying its ability to scale to a 10-way Hypercube, also known as a dekeract. This architecture allows for any processor to be a maximum of 10-hops from any other processor. The benefits are greatly reduced latency in cross processor communication. The downside is that expansion is restricted to powers of 2 (64, 128, 256, 512 etc) making upgrade costs a bit expensive as the size scaled up. Each processor contained 22 DMA channels, with a pair being reserved for I/O to the host processor and the remaining 20 (10 in + 10 out) used for interprocessor communication. This focus on a general purpose CPU with built in networking support is very similar to the Inmos Transputer, which at the time, was making similar inroads in the European market. System management was run by similar nCube processors on Graphics, Disk, and I/O cards. Programming was via Fortran 77 and later C/C++. At the time it was one of the fastest computers on the planet, even challenging the almighty Cray. And it was about to get faster.